Lately I have met a few people who have the courage to start homeschooling their children during high school. Often this is the time during which the majority of people are most afraid to homeschool, as it is seen as the time when you need ‘experts’. 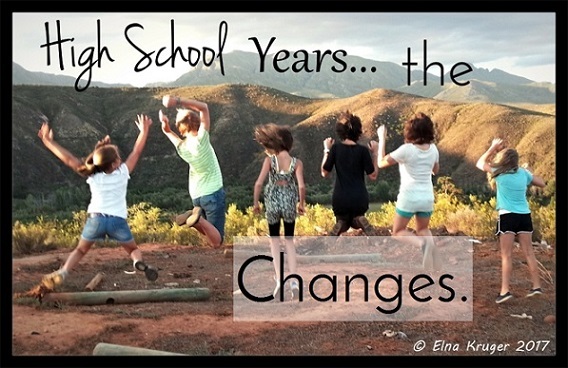 In this ezine I am not going to discuss qualification options at high school level, but what I experienced to be a few significant changes which the high school years bring. The first most obvious thing that changes, is the role you play. Your role changes into that of a guide, coach, mentor and even tutor or administrator, and your student does by him/herself many of the things you used to do together. This does not happen overnight (thankfully), so there is time to adapt, to learn to let go, and to grow into your new role. But it is something that must happen in order for our children to grow in independence and responsibility. The second thing that changes is that enough opportunities must be available for them to prove themselves reliable in order to have more freedom, just like when they were younger. To live more independently, they need to be more responsible. Sometimes I see parents giving their teens ‘freedom to be independent’ without the necessary ‘responsibility’ proven, so the child thinks prematurely that s/he can do what s/he wants, and the results are not always encouraging. I also hear parents say that you cannot ‘tell teens what they must do’...and while I agree with the statement, you cannot force them to do anything, I do believe you can guide, advise, encourage and even warn them in love. A third thing that changes is the workload. The academic load should increase with a definite step-change if a qualification is an aim. It is amazing to see how children rise to the challenge and just manage it all, to prove to themselves they are now in ‘high school’. As they realize they are indeed managing with the new workload they feel proud of themselves and it is as if they are ready to take on even more responsibility. This feeling of accomplishment is a good thing at this stage. · What would you like to learn more about? Why? · How do you think you will do that? · What would you like to achieve this year/quarter? · How can we support you? Lastly, the most important thing I have learnt, is that it all depends on the relationship that has been built over the years. In a relationship built on trust and love in the previous years, one will have the courage to share more. So the biggest challenge during the high school years is to keep the relationship strong, and the communication channels open! This is sometimes more difficult than when the child was younger, as the insecurities s/he experiences during these years may want her/him to shut people out, and close the doors of their hearts. This is a time to be emotionally strong for your child, and help her/him to keep the doors open! Keep on inviting, reaching out and helping them understand themselves better. · You no longer feel like a teacher, but the coordinator of the whole process. · You start to think more about goals instead of schooling day to day. · Your student learns on his own. · You do more “checking in” with your student than directly supervising. · You naturally begin encouraging your student to take on greater responsibility, especially over the future and their own education. · You praise independence, even though still keeping a close watch. · You develop trust when your student completes assignments thoroughly and on schedule. · Your faith in the process increases as your student begins to succeed on his own. · You may feel a lack of control, not always knowing exactly what your child is learning and doing. · Your child’s knowledge might begin to surpass your own, and you’re happy about that! · You begin outsourcing some of the learning. · Record-keeping and organization become more important than ever before. · The decisions you make feel more important. · You’re excited for your child as the path becomes clear, yet you question yourself more than ever before.